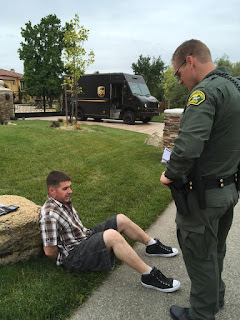 Granite Bay, Calif. - A Granite Bay was arrested after he allegedly stole a package left at the front of a house. Christopher Dietrich, 36, was taken into custody arrested by Placer County Sheriff's deputies after he allegedly stole the package on May 16. Dietrich tossed the package from the car when he realized he was being followed, then got out of the car to confront the officer. Fearing for his safety, the officer drew his weapon and held Dietrich at gunpoint until deputies arrived. Dietrich was arrested for petty theft and possession of a controlled substance, and he also had a warrant for drug charges. He was booked at the Placer County Jail, where he remains in custody with bail set at $10,000. No Comment to " Granite Bay Man Arrested on Suspicion of Stealing Packages "